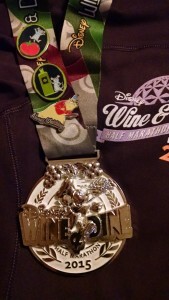 For more information and thoughts on runDisney’s fabulous Wine & Dine Half Marathon, please check out our features on the 2013 (Part 1 & Part 2) and 2014 (Part 1 & Part 2) events. 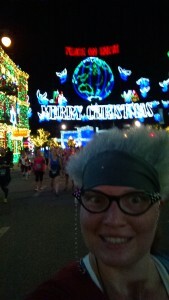 The 2013 runDisney Wine & Dine half marathon was my first Disney race. In our year of runDisney, this was one race that I was really looking forward to. I hadn’t had the best race the first time because of a sad tummy and I was hoping to do better this time. I had a heavy race schedule in the weeks leading up to the race, so I was as prepared as I was going to be. After a few small successes at the Army 10 Miler and the Marine Corps 10K (race review coming soon! ), I felt I had broken through whatever had caused me to perform so poorly at the Navy/Air Force half and the Disneyland half earlier in September. We arrived in Orlando on Thursday night and went straight to Epcot for the Food and Wine Festival for dinner. Later that night we met up with our friends Mike, Candace, and Jenny, back at Disney’s All Star Sports Resort and figured out our game plan for the weekend. 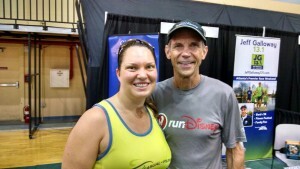 Jen catching up with her coach, Jeff Galloway. I’ve never had a need to be first in line at the expo, but for various reasons we decided to head out there first thing Friday morning. We parked easily and walked into Wide World of Sports about 15 minutes before the expo was set to open. Then we got a text from a friend who was already in the merchandise line and who reported that they had just opened up the vendor section of the expo, so we decided to go straight over to the official merchandise and beat the crowds. This ended up being the right call as we were able to walk right in and snag the items we wanted and get through check out in under 20 minutes (including the time it took to try on a few things). About an hour later when we walked past the official merchandise booth there were lines both to enter the area and to pay—both of which were wrapping around the booth multiple times and probably took a few hours to get through. After snagging our official merchandise, I stopped to say hi to my coach. He had to run off for a speaking engagement, but since I’d missed him at MCM I was glad to catch him even for a few minutes. The rest of the vendors were the same as usual, though I did pick up a travel foam roller to get some knots out of my calves that have been causing ankle problems for me lately. Having checked out the vendors, our group hopped over to the bib pick-up area, where I encountered probably my longest lines at a Disney bib pick-up ever. I attribute this to doing the expo in the reverse order, and even though they were longer than what I usually see they weren’t more than 15 people deep. The swag was typical for a Disney race—a shirt and a small Clif bar. I liked the shirts a lot. They were long-sleeve tech shirts in a dark blue with a classy design. And best of all, they had men’s and women’s cuts. This is a huge improvement over my first Wine & Dine race, for which my unisex shirt is so big I can’t wear it in public. While my husband and I regularly theme our costumes together, we’ve never costumed as part of a group. But the five of us decided to do a group costume this time—which pleased three of us and the other two begrudgingly went along with it. The first successful Team Casual Runner GROUP costume effort. Wanting to take some of the pressure off the non-costumers, we chose a group with a lot of flexibility in the amount of detail needed to pull off recognizable costumes: monsters from Monsters Inc. Mike was Mike (Wazowski), Candace was Boo, Jake was George (the one who has a sock stuck to his back), Jenny was a CDC agent, and I was Roz. My costume was pretty easy, and I was able to re-use several items I already had. The major pieces were some cat-eye glasses and a metal eyeglass chain, an old-man wig cut up and attached to a grey Bondi Band headband, and a burgundy long-sleeve sweater that we altered by adding buttons and cutting off a bit of the length. Everything else was: Khaki Sparkle Skirt with built-in shorts, white Nike tank top, white Adidas sports bra, Injinji socks, Brooks Adrenaline GTS 14 shoes, Garmin Forerunner 620 and Gymboss interval timer, and Camelbak Marathoner hydration vest. I bet you didn’t know that Roz was into Rock N Roll! Even after the sun went down it was hot and humid. We were getting conflicting weather reports and didn’t know if it was going to rain or just be hot and miserable. Since we didn’t know exactly what to expect, I don’t think any of us modified our race attire to account for potential weather. Although there was a line for the bus outside our hotel, we were able to catch a pretty early one over to the starting line at Wide World of Sports. Traffic seemed to move ok for us and we arrived before 8:00. I saw some reports on Facebook of people having bus troubles, but the only thing I can say is that I’ve never had trouble when I’ve caught an early bus. Waiting for later busses definitely has risks as traffic becomes more congested the closer it gets to the race start. One of our friends had positioned herself near the entrance to the corrals so she would be able to get a spot in the front once they opened up, so our group went over to meet up with her and hit the port-a-potties. From where we were standing we could not hear the announcements (this was a problem in a few areas in the staging area) so we were surprised when everyone around us started heading out of the pre-race holding areas. Since it was close to the time that the corrals were supposed to open, we assumed everyone was heading to the corrals, so our group split up to go to our respective corrals. As we soon discovered, though, instead of opening the corrals runDisney was moving everyone indoors due to reports of lightning strikes in the area. I honestly don’t know how they would have handled it if the race had started anywhere else, but because we were at Wide World of Sports we had easy access to shelter in the field house and stadium. For more details on the pre-race weather delays and course changes, please check out Mike’s article now. About an hour later they gave the all-clear and we all headed back to the corrals to start the race. It took another 45-ish minutes to get everyone back in place and the race was quite behind schedule. 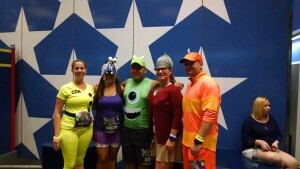 runDisney made the controversial decision to shorten the course and then sent us on our way with the usual fanfare. In my opinion, runDisney handled this whole situation very well and I support their decisions from moving people to shelter, to delaying the race, to shortening the course. Florida is notorious for lightning and damage from sudden severe storms–which is exactly what my weather app was showing moving our way. Severe heat had already claimed a fatality that day in a race in Savannah, GA, and even after the storm cleared our area the humidity remained pretty brutal. And with the delay, the back-of-the-pack folks would be lucky to finish before Disney would be forced to open up the roads to traffic and they would have missed the entire after party. I’ve heard a lot of complaints and other solutions that Disney could have done instead of what they did, but based on the facts I had available to me (and I know I don’t have all the data that they were working with) I would have made the same call. The one suggestion I would make if this were to happen again would be to have more frequent in-person communication. While I was able get timely updates on Twitter and Facebook (and I do commend them on their use of these platforms), some areas didn’t have great cell coverage and it was occasionally tough to get the updates. Ensuring that all the speakers functioned and using the PA systems in the shelter locations would have gone a long way to keep people informed. For more details on the pre-race weather delays and course changes, please check out Mike’s article now. The shortened course turned out to be a little under 7 miles. We followed the original course out of Wide World of Sports and on to Osceola for about a mile. Shortly after the first water stop, rather than continuing down Osceola to Animal Kingdom and back, we turned right onto World Drive toward Hollywood Studios and hit mile marker 8 soon thereafter. From there we followed the original course through Hollywood Studios to see the Osborne Dancing Lights, took the walkway to Epcot, rounded the boardwalk, and finished in the Epcot parking lot. Personally, I enjoyed this short course a lot. I do love seeing Animal Kingdom at night, but the out-and-back portion is something I’m happy to skip. While the race was more congested than usual though the parks because we didn’t have the miles at the beginning to spread out, I didn’t find it to be that much of a problem (though I did have to adjust my run/walk intervals at a few points to better match the conditions around me). Want to know more about the full Wine & Dine Course? We have all of those details in our reviews of the 2013 (Part 1 & Part 2) and 2014 (Part 1 & Part 2) events. I may not have run a certified half marathon, but I happily earned this SMO by running the course Disney gave me. I ran the course Disney gave me and I was proud to collect this SMO. I thought the silver and white tone-on-tone looked really classy, and they learned from last year’s spinner fiasco and just gave us solid metal medals. It’s a good-looking SMO and I happily wore it around my neck at the after party and the next day at the park. With the shortened course I arrived at the party a full hour earlier than I would have if the race had occurred on schedule. Plus, I wasn’t as tired, so I could enjoy it more. I met up with my group for a drink and bite of food, then we separated to finish our party however we wanted. My husband and I walked around World Showcase to keep our muscles loose, picked up a few of our favorite food items, rode Spaceship Earth, and caught a bus to the hotel around 3:30 AM (others may have stayed a bit later and closed down the park). 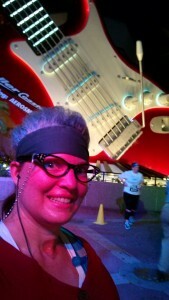 I did use my iPod for this race, but the more memorable musical moments were ones supplied by Disney. It really is amazing to run through the Osborne lights with Christmas music playing, and it’s one of my favorite memories from both years that I’ve run this race. I can neither confirm nor deny whether I started dancing like Baby Groot under the underpass where the DJ was playing “I Want You Back” by the Jackson 5. And the cast members dancing to “Jump” brought a great energy to the evening. 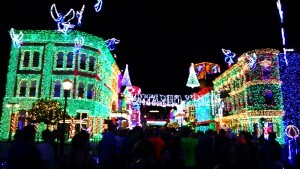 Runners enjoyed a private showing of the Osborne Lights during their final year at Walt Disney World. I don’t mean to minimize the complaints and disappointments experienced by others at this race. If this were supposed to be my first half marathon, I’d probably be bummed that I didn’t get to run it, too. But one thing I’ve learned as a runner is that sometimes you just have to go with whatever the world is giving you. Is it raining on a day you’re supposed to do a long run? Ditch your electronics and experience the sound of your feet splashing though puddles and feel the drops hit your head as you dance down the trail. Interval timer die mid-run? Try running by feel rather than being a slave to a clock. Did race officials divert you from the normal course unexpectedly? Enjoy the fact that you will automatically get a PR for that specific course and be thankful that they are looking out for your best interests so that you can survive to run again another day.